This past Saturday was quite literally a double drinking day for most of us here in the USA. It was The Kentucky Derby Horse Race and Cinco De Mayo rolled in to one alcohol fueled package. My day began at a fun filled event sponsored by Bulleit Bourbon in Downtown Los Angeles. Fellow drink enthusiasts and esteemed members of the alcohol community had gathered at Seven Grand to support ‘Speed Rack’ a wonderful organization that gives money towards Breast cancer research and helps women in the bar industry suffering from the disease. 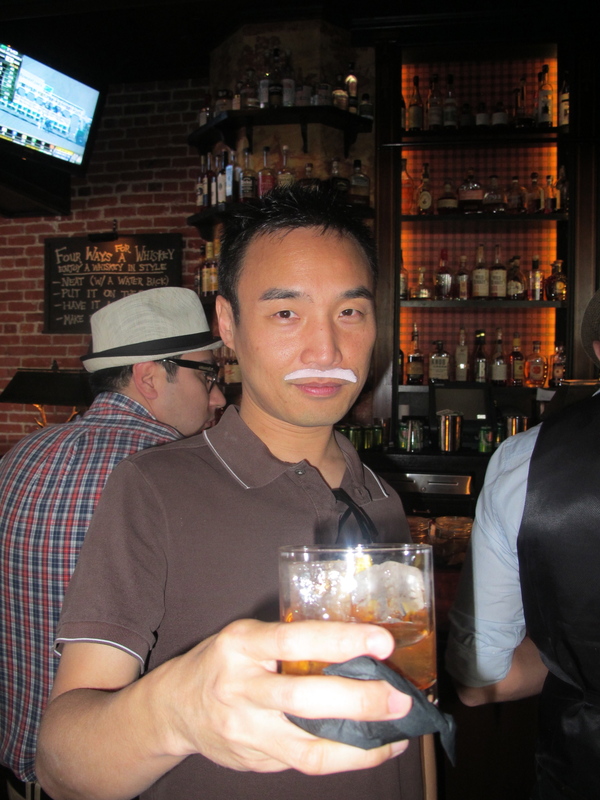 Daniel (Thirsty in LA) sporting a pink mustache! My boyfriend and I had a really good time, it was our first year at the event so we mingled, received Bulleit Bourbon glassware as gifts, joined in on fun hat competitions and pulled names of horses out of a hat to watch the race with. $20 to SpeedRack got you entry to the event and an unlimited supply of Bulleit Bourbon drinks, in particular the Mint Julep. I must say I never knew that the Mint Julep was known as ‘The Derby Drink’ until Saturday when my twitter blew up with photos of crushed ice and mint leaves from all the drink bloggers I follow. For those who don’t know the drink (I will be putting it up as ‘Drink of the Week’ tomorrow,) I will say it is a very refreshing Whiskey based beverage that is sweet, minty and very cold! 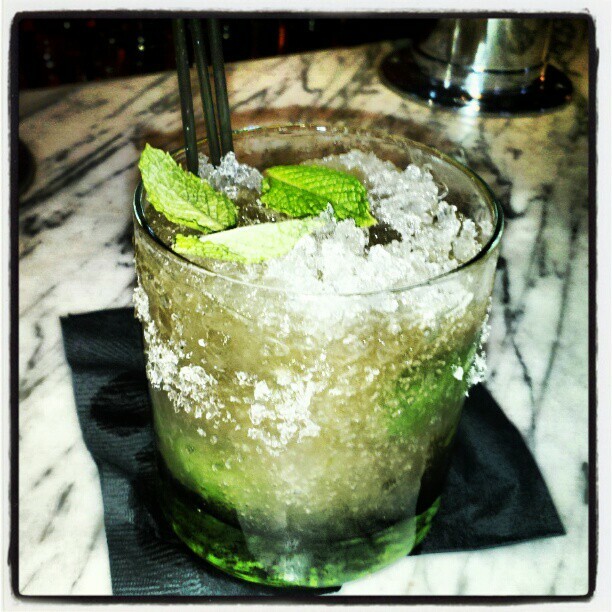 It’s always served over crushed ice, almost like an alcoholic slushy and is very good when made correctly. The bar men at Seven Grand didn’t disappoint. When the race began I have to admit I was screaming pretty loud (think Audrey Hepburn in the 1964 film ‘My Fair Lady’), one because i’d had many a shot of bourbon by that point and two because there’s something really exciting about betting on something you have no power to control, I mean your horse will either win or lose. 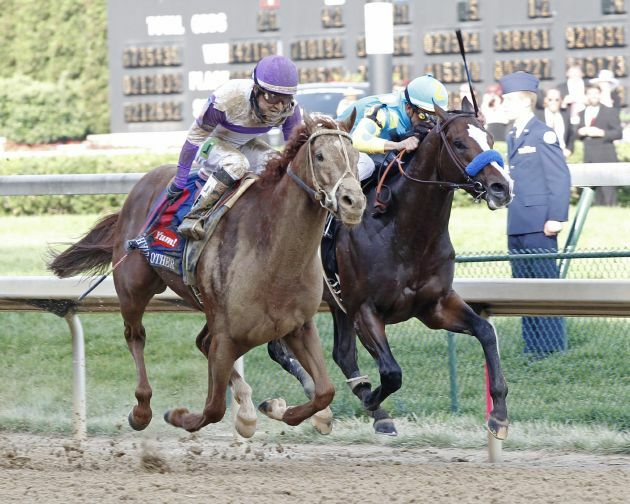 You see it just so happened that the Kentucky Derby fell on Cinco de Mayo this year. For all my British readers or those who just don’t know, Cinco De Mayo (Spanish for ‘5th of May’) is basically an American holiday that disguises itself as a Mexican one! The date is observed now mainly by Americans as a celebration of Mexican heritage, and to commemorate the Mexicans win against France at the Battle of Puebla on May 5, 1862. Whilst in Downtown FutureGreg and I decided to stop in at Bottega Louie for lunch (still my favorite restaurant) and ended up trying the incredible new Artichoke Pizza. I strongly urge you to get this pizza, it was simply fantastic. 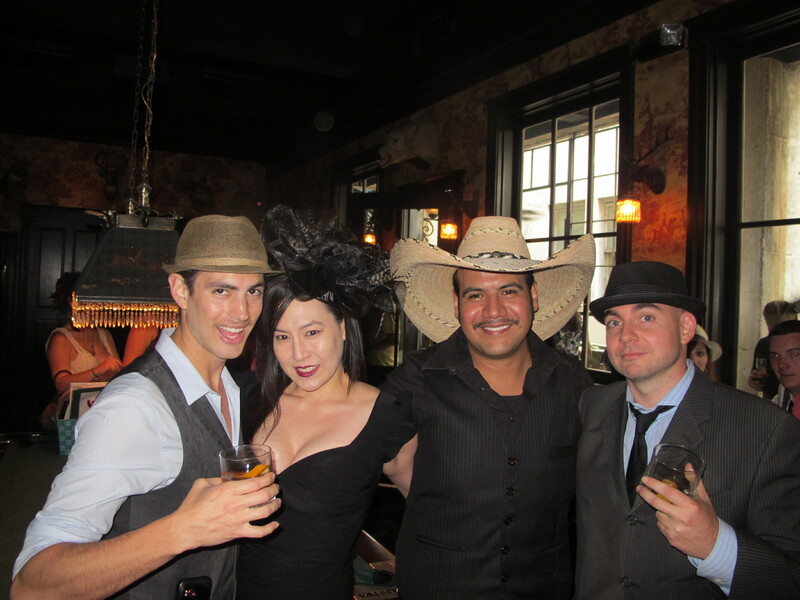 I ended up heading to Bar Chloe in Santa Monica for the second half of the day and the Cinco De Mayo celebrations, the bar staff wore Sombreros and served Tequila based drinks to the rowdy crowds and yes, I wore a Poncho to get in to the Mexican theme of the night! All in all it was a wonderful day, and helped immensely by the new metro they’ve installed between La Cienega and Downtown LA. What a God send…We didn’t have to worry about parking or drunk driving, it was just 30 minutes door to door. Brilliant! We will definitely consider doing the Kentucky Derby party again next year. 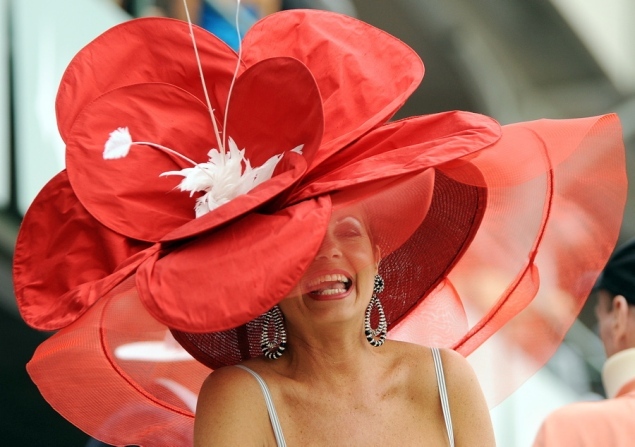 Only next time I will be sure to wear a fun ‘Day at the races’ themed hat like the ones below. 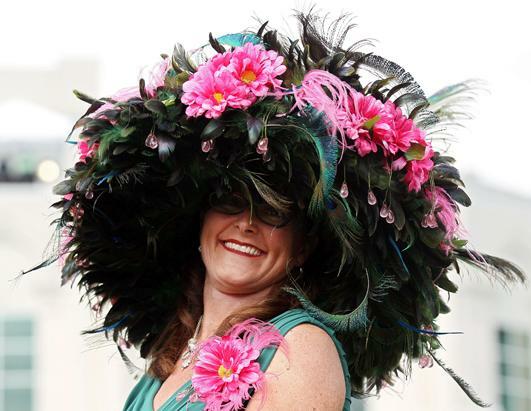 These images were taken at the actual Kentucky Derby 2012, I got the photos from http://www.abcnews.com. The red one is just FAB! 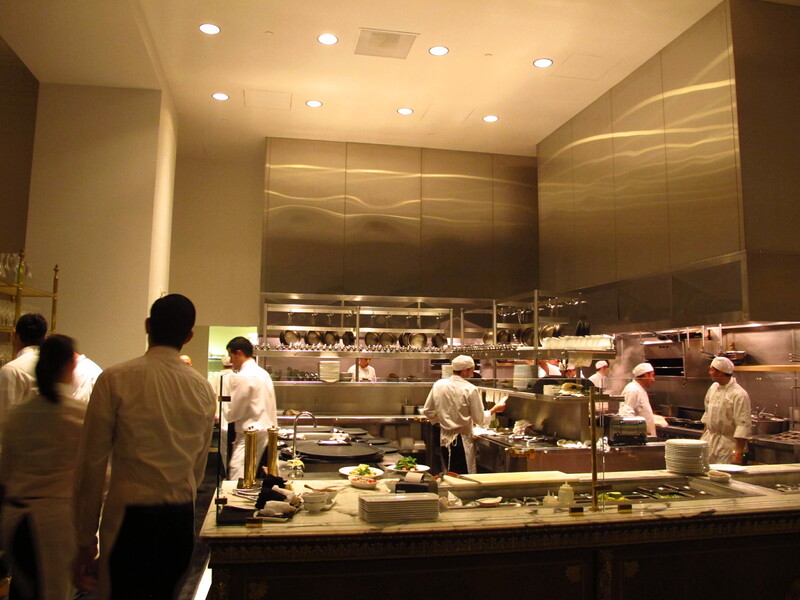 I love this place and rank it as one of my favorite Restaurants in all of Los Angeles. I am finally putting up a review after my fourth visit and yet again I left utterly satisfied. There is an elegance and attention to detail in this restaurant that I adore, from the marble flooring and delicate ceiling designs to the beautiful pink salt crystals in the shakers on the tables. If you’re going to come here for dinner you should know that they do not take reservations and it is strictly first come, first served. It is generally always busy at night so I recommend getting there at least half an hour before you plan to eat. We always start off by giving our name at the front desk (which they write down in a gigantic reservations book) then head over to the bar for a cocktail. 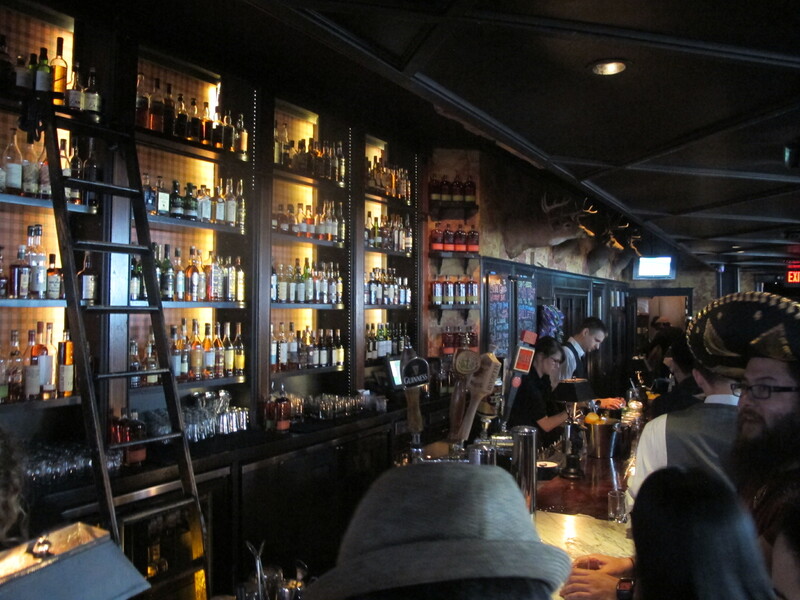 The bar is small but cute, has an attractive marble top and fairly decent drinks list. This last visit I started with a ‘Japanese Sour’ and my boyfriend (FG) had ‘A Night in Oaxaca’. My drink was delicious, basically a Whiskey Sour with the addition of Port, I found the port added a layer of complexity to the sweetness and overall taste of the drink. The ‘Night in Oaxaca’ was smoky from the mezcal but still balanced and flavorful with a lightly bitter after taste. My boyfriend seemed to enjoy it, although it was little too bitter for me. The room has an open floor plan so you can see in to the kitchen and pizza ovens, something I personally love and think gives great character. The whole building has extremely high grand ceilings and is technically one giant room, but it’s sort of divided in to sections. As you enter there is a small cafe style area with a bakery (where you can buy macaroons and pastries), there is the Bar section with the main kitchen adjacent, a large main dining room area and a pizza kitchen at the back of the room. I noticed that they don’t have background music at all at this restaurant. It is somewhat noisy though, the high ceiling echoes the sounds from the Kitchen and the lack of material in the room allows the sounds of people talking to bounce directly off the marble flooring. I personally really like the hustle and bustle atmosphere this creates. The tables set out in such a large open space makes me think of a French court yard, especially on the ‘Cafe’ side. I almost feel like you should see little birds hopping from table to table as if you’re outdoors in Paris. Despite being busy (on a Monday night) we were seated fairly quickly and this time were placed in view of the pizza station. I found myself staring at the cooks for ages as they made the pizzas for the restaurant. It’s like a performance seeing them work and hard to look away. 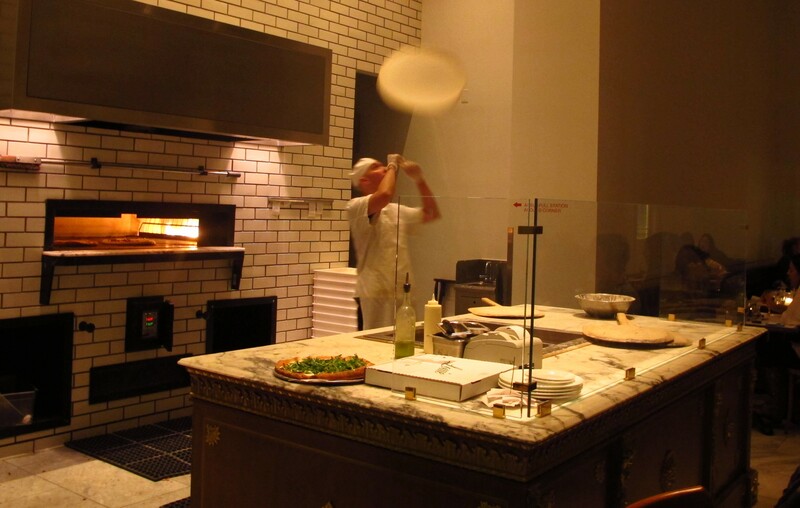 One Chef moulds and tosses the dough to make the base (and throws it pretty high) whilst the other adds toppings to order and places it in the large open fire oven behind him. After watching a few pizza bases go flying through the air, we decided on this visit we had to try a pizza. I think it is well worth the $18 price tag when you can watch your dinner being prepared with the utmost care and baked to order in front of you. I would definitely recommend getting a pizza here, although I suggest you do it as a shared plate like we did. The pizza was larger than I expected and we ended up taking a few slices boxed up with us. Out of the many pizza choices we decided on the Blanco and I was impressed with how much flavor came through with no tomato base. The crispness of the pizza crust was perfect and the addition of arugula was interesting. The garlic came through just enough for it not to need anything else, it could be considered a little bland for some, but we enjoyed it as it came. When going anywhere I always look on foursquare and yelp for reviews and recommendations. The dish that gets the most reviews at Bottega are the ‘The Portobello (mushroom) fries’. Now, if you have read the ‘about me’ section of my blog you will know that mushrooms are definitely up there with my least favorite items. I actually have no problem with their flavor, I will happily eat a cream of mushroom soup, but I find their texture to be reminiscent of what i imagine a slug would feel like to chew on. I am therefore not a fan of mushrooms raw or only partially cooked. We went ahead and ordered them on a previous visit anyway. FG really likes them, and although they’re not my favorite item, I certainly don’t dislike them. They are deep fried Portobello mushroom slices and come with a very rich creamy aioli. Deep fried anything is always going to taste pretty delicious but a little too greasy for my liking. They are an interesting appetizer though and worth trying as an alternative to fries. We ordered the Hangar steak (medium/rare) to share and this is what I usually get on my visits here. The vegetables change based on what is in season or currently available, this version had carrots, rainbow beans, mushrooms and asparagus on top. All cooked perfectly in an ‘al dente’ style, (still slightly firm but not hard center). We ordered a side of broccolini too, which had soft ends and crunchy stalks. Delicious. The steak was juicy and flavorful, the vegetables were tasty and fresh. The overall dish was very good. On a previous visit we also tried the Lasagna. This was ‘divine’ according to FG, and every time we return he questions whether he should get it again because he remembers it as being utterly delicious and bursting with flavor. It has a creamy béchamel sauce and three kinds of cheese mixed in there. For its price point you certainly can’t go wrong, so if you want a good pasta dish here then I highly recommend it. 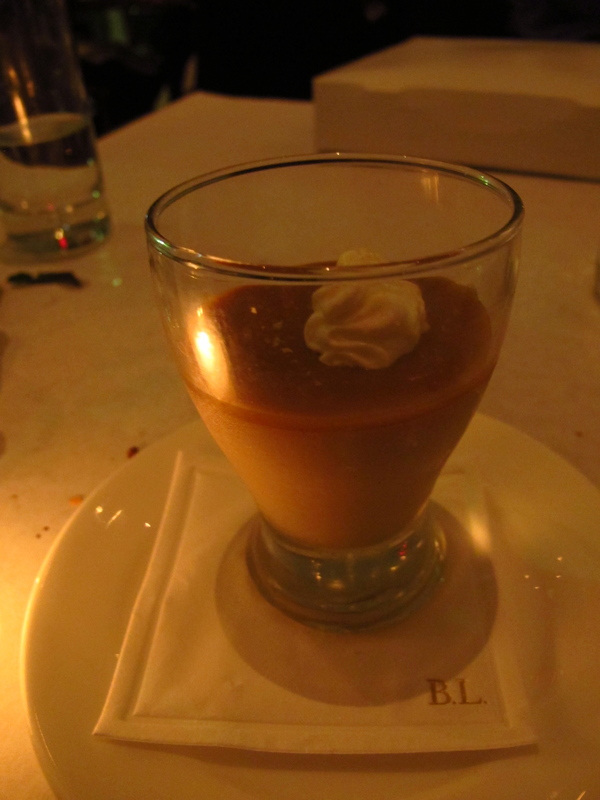 We decided to get a dessert to finish, and went for the Butterscotch Budino which was basically like a ‘Pot de Creme.’ It was outstanding. It has a soft custard center with butterscotch flavors, and a salty creamy finish. It was so good. I occasionally got a little salt crystal on my tongue, but the sweetness followed quickly and made for an interesting play of flavors in my mouth. I highly recommend this dessert, but if you are more in to pastries stop at the cafe on the way out. 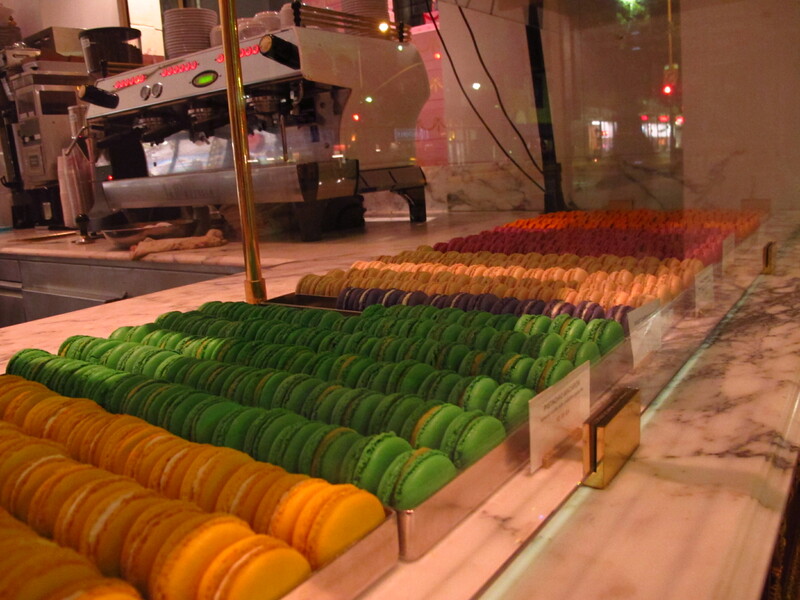 They have macaroons in a rainbow assortment of colors and extremely interesting flavors which include Rose, Chocolate Orange, Salted Caramel, Pistachio, Espresso, Earl Grey, and Tahitian Vanilla to name just a few. For the quality of food being presented I feel the prices are more than reasonable here. There are plenty of options to choose from and all the dishes we have tried in the past have been excellent. The atmosphere and the ambience of this place really makes for a wonderful night out. It could be a little loud for those wanting a more intimate setting, but I think it’s still a great and fun location for a date night. The drinks were good but not excellent, they were executed correctly and the bar staff were all friendly they just don’t ‘Wow’ me. I feel like the drinks list could be more interesting, especially with so many great options in the kitchen. The ones we had were by no means bad, just not as exciting as they could be. All in all, this is still one of the best restaurants to venture out to. It is fun, young and trendy. The food is great, the drinks are good and the ambience is exciting. When we can’t think where to go on date night, we always know we have this as a great option. Having a ‘FussyOne’ as a repeat customer means they must be doing something right! I recommend you go see for yourself.